To me, carrot cake is a winter cake, not quite Christmas, but definitely spiced just the right amount. 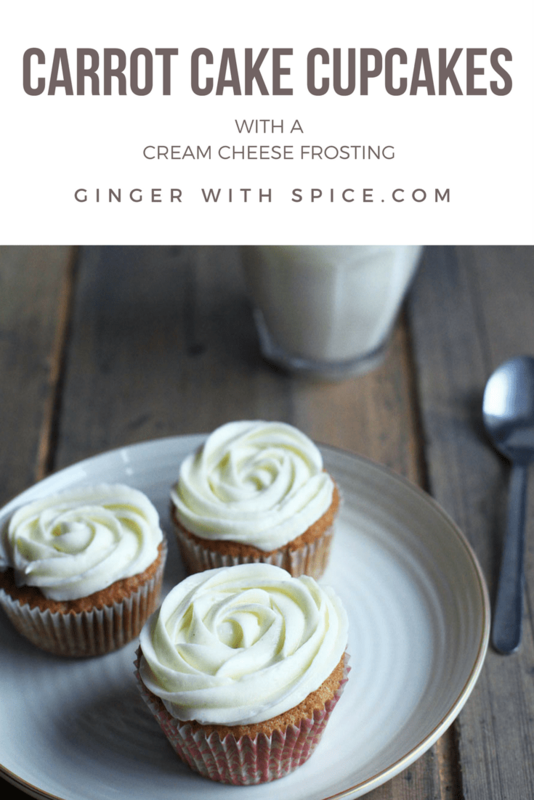 The carrots make these carrot cake cupcakes very moist and the hint of cinnamon goes so well with it. Add cream cheese and we’re in heaven. When I put one of these in my mouth it was like eating a spiced cloud with cream cheese. Really, so incredibly fluffy! It’s actually a cake recipe, but I wanted petite easy-to-transport cupcakes instead. So if you want to make a cake out of it, you can, using a small 20x10cm tin and baking it 5-7 minutes longer. You know I talk about eggedosis a lot (here and here). I will again, until everyone know what eggedosis is. It is whipped sugar and eggs until white and fluffy. Do that, it will take some time, but eventually it will turn white. Mix flour, cinnamon, baking soda, salt and vanilla bean sugar. Alternate pouring the flour mixture and pouring the oil into the eggedosis – egg mixture. Be careful! You do not want to beat the air out of the eggedosis. It should remain airy. Very important in order to get the light as air carrot cake cupcakes. Continue with the careful hand, stir in the shredded carrots. Do not taste the cake batter, because that tastes like crap. 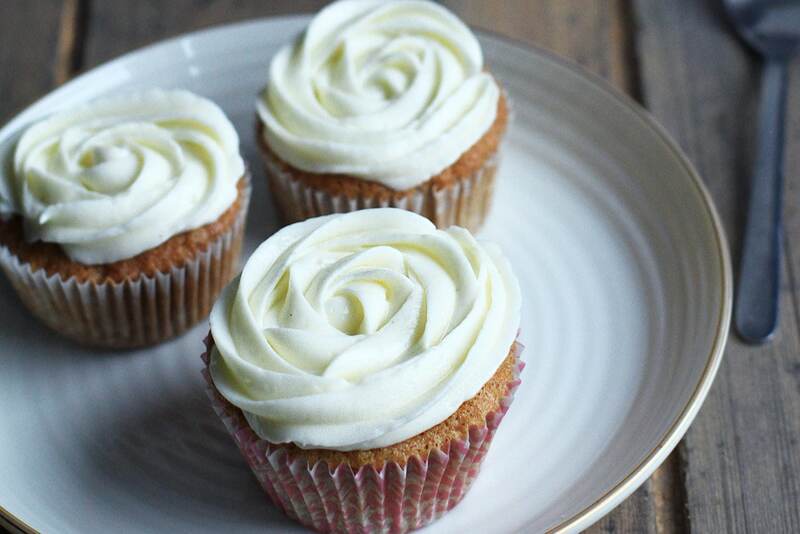 But when it’s baked, it is heaven in a carrot cake cupcake. Pour the batter into muffin tins. I like my cupcakes small, but you could use the normal (large) sized cupcake tins too. 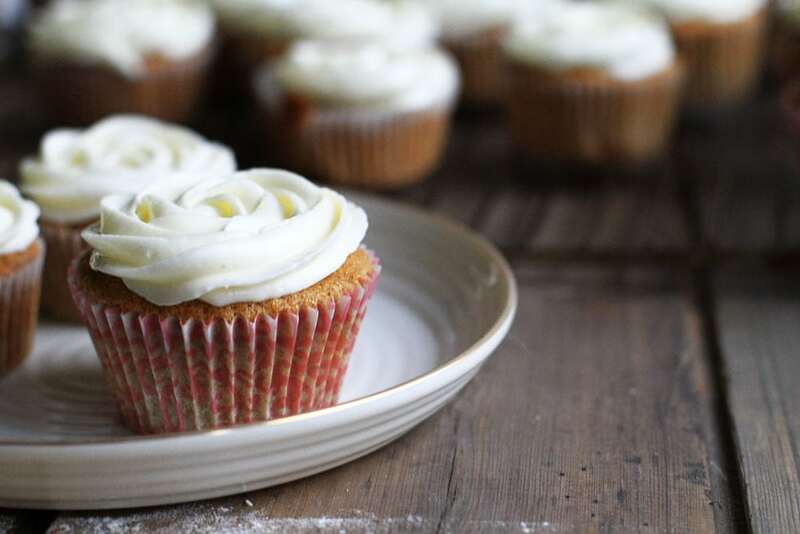 You might have to bake them for a little longer (toothpick trick – take a toothpick into the cupcake when you think it’s done, and it is if the toothpick comes out clean). I bake them on 175C (350F) in the middle of the oven for around 17 minutes. Taste one and let the rest cool on a rack. Meanwhile, let’s get to the super easy cream cheese frosting. I’m not always dead sure on my measurements on this, because I taste along the way and add a little bit of this and a little bit of that. However, as a start I would suggest taking 250 gr of cream cheese, 250 gr of powdered sugar and 2 tsp vanilla bean sugar as a base. Mix with a handheld mixer until smooth. Try not to mix more than necessary. If it’s too sweet, add in more cream cheese, not sweet enough, more powdered sugar, and so on. You can even add cardamom, cinnamon and the like to really oomph up the spice factor. The cupcakes are cool and we are ready to frost them. You can just add it with a knife, but if you want my fancy flower frosting, you have to use a piping bag with a star tip. 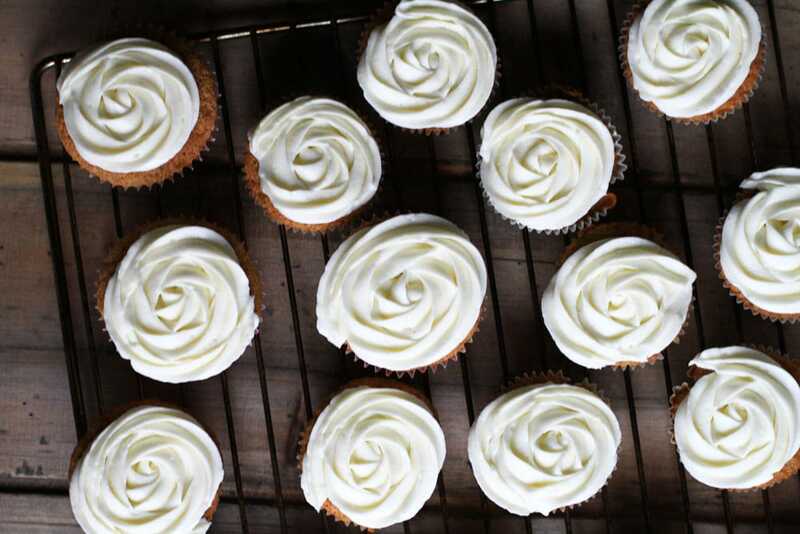 Begin in the middle of the cupcake and in a circular motion work your way to the outer part of the carrot cake cupcake. It’s so simple, yet makes for a rather pretty cupcake and that without 3 times as much frosting as you actually want to eat. Hope you really like this recipe! And I would love to hear from you, either in the comment section below, or tag me @thegingerwithspice on Instagram. And don’t forget to Pin it for later! 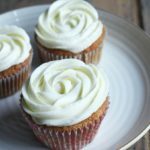 The carrots make these carrot cake cupcakes very moist and the hint of cinnamon goes so well with it. Add cream cheese and we're in heaven. Make eggedosis: whipped sugar and eggs until white and fluffy. It will take some time, but eventually it will turn white. Mix flour, cinnamon, baking soda, salt and vanilla bean sugar. Alternate pouring the flour mixture and pouring the oil into the eggedosis - egg mixture. Be careful! You do not want to beat the air out of the eggedosis. It should remain airy. Very important in order to get the light as air carrot cake cupcakes. Continue with the careful hand, stir in the shredded carrots. Do not taste the cake batter, because that tastes like crap. 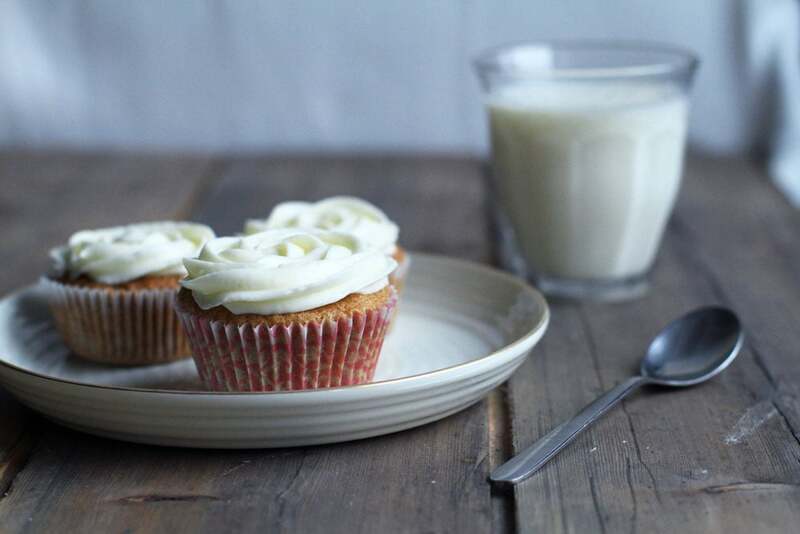 But when it's baked, it is heaven in a carrot cake cupcake. Meanwhile, make the cream cheese frosting: As a start I would suggest taking 250 gr of cream cheese, 250 gr of powdered sugar and 2 tsp vanilla bean sugar as a base. Mix with a handheld mixer until smooth. Try not to mix more than necessary. If it's too sweet, add in more cream cheese, not sweet enough, more powdered sugar, and so on. You can even add cardamom, cinnamon and the like to really oomph up the spice factor. The cupcakes are cool and we are ready to frost them. You can just add it with a knife, but if you want my fancy flower frosting, you have to use a piping bag with a star tip. 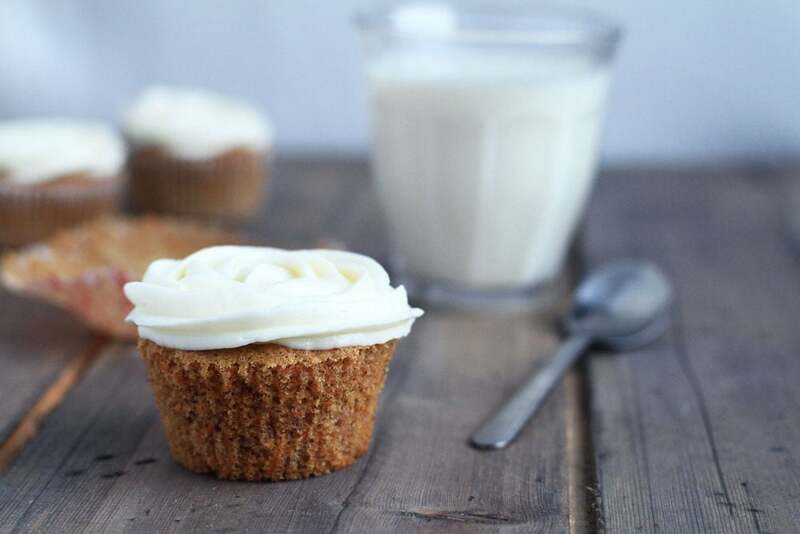 Begin in the middle of the cupcake and in a circular motion work your way to the outer part of the carrot cake cupcake. It's so simple, yet makes for a rather pretty cupcake and that without 3 times as much frosting as you actually want to eat. *If you want to make a cake out of it, you can, using a small 20x10cm tin and baking it 5-7 minutes longer.